I keep imagining how this feeling is only going to grow and grow over the next few months. It gets stronger with every travel blog I read and every day dream I have. A few hours ago, Jessica and I enjoyed what is quickly becoming an early-afternoon tradition for the two of us: pad thai and spring rolls from a roadside food-cart. Along the side of the street, a half-dozen little carts are packed in next to one another. We've tried a few of them at this point, and identified one as our favorite. Jessica places our order while I run into the nearby 7-Eleven for a couple of sodas. By the time I get back, a minute or so later, everything is ready. We find ourselves an unoccupied spot on the little stairs the run the length of the sidewalk, make ourselves comfortable, and tuck in. There isn't even any chicken in it. Those of you who know me (and my carnivorous ways) will understand my disbelief at finding such joy in the consumption of what is in fact a decidedly vegetarian dish. I don't quite understand it myself. Both of us just love pad thai, and we partook of it often back in Philadelphia... but it was never this good. Getting it from the food-cart is key. It's not just that they make it better than any restaurant, or that it's ready in 45 seconds, or that it costs less than 40 cents. It's everything that happens next. It's sitting on those stone steps in the sweltering heat, wiping the sweat from your forehead between mouthfuls. It's watching the madness spin past you on the street as pedestrians and cars and tuk-tuks (elongated, noisy, psychadelic golf carts) swarm about in a frenzy of near-collision. It's the fragments of conversations that wash over you in a dozen different languages. It's the ubiquitous saffron-cloaked Buddhist monk that floats by alongside the equally-ubiquitous backpack-laden farang (a Thai word which basically means gringo). In a word, it's Bangkok. New timezone now: 12 hours ahead of home, 7 hours ahead of GMT. Malaysia will be an hour ahead of that, and Burma will for some reason be a half-hour behind. Our sleep schedule was thrown all to hell, and it was several long days of barely leaving the hotel room before we fully adjusted. New language. By the time we'd traveled from South America to Spain, I had "travel Spanish" down pretty well, and was even able to make some clumsy small-talk with people. Jessica, of course, had progressed well beyond that point, thanks in part to the month's worth of classes she'd taken in Buenos Aires. In Turkey we'd had to start over again, and we slowly but steadily built ourselves up a respectable Turkish vocabulary: not enough to talk politics with, but enough to buy bus tickets and find the bathroom. And now we have Thai, a "tonal" language in which pitch affects meaning. And we're back at square one again. New etiquette. Touching someone's head is gravely offensive here, as is putting your feet up on the crossbar of your chair. Instead of the handshake we now have the absolutely adorable wai (a prayer-like gesture, with your palms clasped together in front of you). And everywhere, everyone is smiling. Thailand isn't called the "land of a thousand smiles" without good reason. At first, groggy with lack of sleep and a bit overwhelmed by the sensory overload of bustling Bangkok, the adjustment wasn't easy. But now with our feet back under us, as we gradually make more and more of this city our own, everything seems to be coming along just fine. It was on our way back to our hotel after running some errands that it happened. We were lost in conversation, walking alongside a massive boulevard called Ratchadamnoen: one of the busiest roads in the world, where eight lanes of traffic roar by 24 hours a day in an endless cacophony of car horns, squealing tires, and mufflerless engines. And suddenly the world stopped. I'm not sure exactly when it happened. I don't remember which of us it was that first noticed that everything had gone silent. One minute, we had thousands of cars flying by on one side and hundreds of pedestrians flying by on the other. The next minute, every singe lane of the street was empty, and every pedestrian had stopped in his tracks. People sleeping on benches had jumped to their feet, standing almost at attention. Nothing moved. And it was all so shockingly, unnervingly silent. Bangkok isn't a quiet city. It might not be quite as big as Buenos Aires or Istanbul, but it is by far the most vibrant, active, noisy city we've been to. Standing in that stillness and silence was eerie. Motorcycles flew by, and then police cars. And then, in the middle of it all, an enormous cream-colored Rolls Royce. 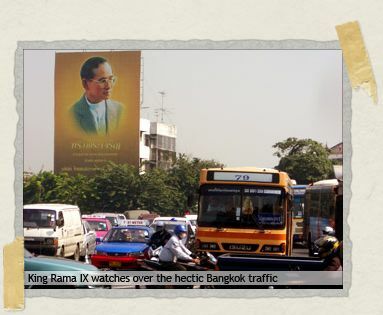 There was no tinted glass, and no mistake: in the back seat was Rama IX, the king of Thailand, who has ruled his country longer than any other monarch in the world today. There is nothing in either the US or the UK that compares to the love that the people of Thailand have for their king. Neither President Kennedy nor Princess Diana enjoy in death the adoration which this gentle, bespectacled photographer enjoys in life. And in that moment, while the busiest city in the world held its breath and all I could hear was my own heartbeat, in that moment I loved him too. And then, as suddenly as it had come, it was over. The motorcade had passed, and the traffic had returned, and somewhere the volume knob was turned back up to 11. And a moment or two after everyone else, Jessica and I shook ourselves out of our reverie, and continued on our way. Pad Thai and posters of the king…I do like Bangkok and I can almost smell the pollution caused by the 2 stroke engines. Have you had the soup with the strange pig balls yet? Amazing. Happy (almost) New Year! 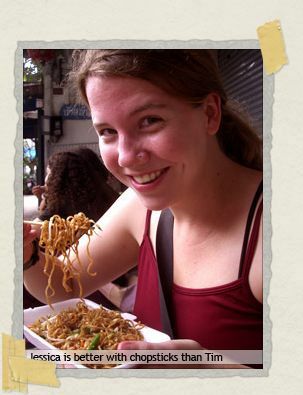 love Pad Thai too, we are all jealous! 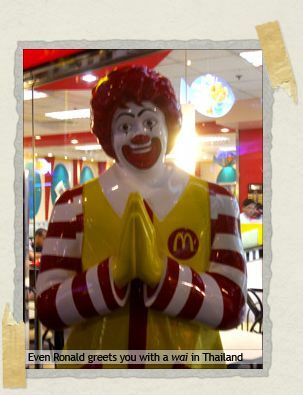 that picture of ronald makes me a little nervous. something about the eyes. maybe the psychadelic golf carts got to him. the early afternoon pad thai and spring rolls sound delicious. wow, your saw the king, we saw that spectacle once but only from a hotel room, on the 20th floor, even seeing him from there was a powerful experience, you guys are sooo lucky. Fantastic Pad Thai and King entries – for a brief, lovely, happy, sad moment I felt it all again – the heat, the sweat, the smells, the tastes, the colours, the frenzy, the pollution, and always in the background the laughter and shrill drawnout 'Ka's' that punctuaute the chatter of Thai women. Looking at all the entries on this stie it is very clear to me now that you two are very much loved just like the king of Thailand… All hail Timmy and Jessica hedgehog! I'm going to be very disappointed if you don't visit at least one gentlemen's club in Bangkok, Tim. A belated happy new year to you guys!